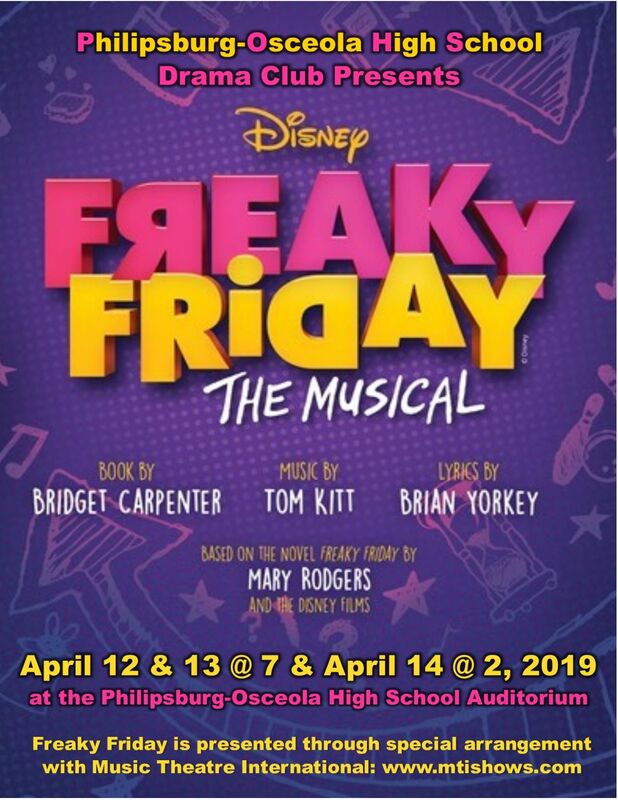 PO Drama Club presents Freaky Friday!! POMS sponsored their annual Pi Day Celebration on March 14, 2019. This year, we collected 462 items for the local food bank and 298 items for Happy Valley Animals In Need. We were also able to give each charity a $200.00 donation. This year, we had a special guest from WTAJ Channel 10, Jordan Tracy. 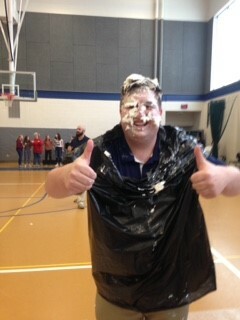 He was a member of the staff relay team and was also pied. Thank you to all who supported this fun event. Join POMS and Centre Moves for the Fit Families Challenge! Families throughout Centre County are challenged to get moving during the month of April. Participants can register online or by submitting a registration form to the YMCA. Visit https://www.centremoves.org/fitfamilieschallenge for more information about rules and prizes!! Philipsburg-Osceola Middle School students will soon participate in the upcoming 2019 Pennsylvania System of School Assessment (PSSA) and the Keystone Exam for Algebra I. Please encourage your child to do his or her best on the PSSA/Keystone without creating test-anxiety. Attendance is extremely important during PSSA/Keystone assessments. Although illness cannot be avoided, we ask for your cooperation by not scheduling appointments during the testing window. 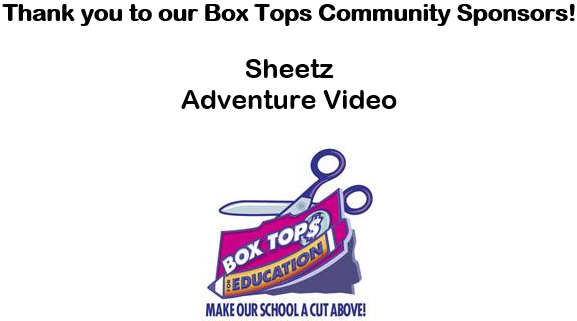 Also, district policy states that no educational trips will be granted during the PSSA/Keystone testing window. Please read the attachment for dates and additional information that will assist you in preparing your child to be successful. POMS art students are decorating the walls with public service announcements to create anti-bullying awareness throughout the entire building. Philipsburg-Osceola Middle School Homework Club! 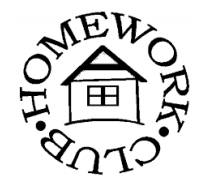 Students: Please join us for Homework Club at Philipsburg-Osceola Area Middle School on Tuesdays, from 2:40 to 3:45 starting October 23rd, 2018. If you have any questions please call 814-237-5731 or email cjackson@ccysb.com. Don’t forget your homework and a book to read. We hope to see you there! Mia Koptchak, 7th grade student, designed the 2018-19 student agenda cover! Parents will use the school entrance that leads to the middle school office by the marquee. Busses and cars will now use the same entrance. Please note that this is a different traffic pattern than in the past. After dropping off or picking up your student, please follow the car or bus in front of you, single file, to exit. Students will still use the sidewalk and enter by the cafeteria doors. You will exit using the administration entrance. Remember that all busses have the right of way and to be sure to proceed with caution. Thank you for your patience and cooperation during our pick up and drop off time. This pattern keeps all traffic moving the same direction and eliminates students directly beside vehicles when entering the cafeteria. School Personnel will be available to help. Students arriving after 7:35AM will need to be signed in at the main office. Please use visitor parking located on the side of the main office. All students will go through security measures upon entering the building. Parent pick up in the afternoon will not occur until after the first wave of busses are dismissed from the POMS regardless of your arrival time. This is expected to occur each day at 2:35 P.M. Please keep all entrances leading to the school open. School Personnel will be available to help. Students leaving before dismissal will need to be signed out at the main office. Please use visitor parking located on the side of the main office. All visitors will need a form of identification to use in the kiosk before entry approval into the building.